Watching your purse strings while feeding your family needn't mean you are stuck preparing uninspiring, unhealthy dishes using the same old store-cupboard ingredients. This book provides quick, nutritious and hearty recipes that will reinvigorate your idea of the budget family meal. With 50 recipes suitable for brunch, lunch and dinner, using easily accessible ingredients, you'll never be stumped for what to make, and when. Feast on Linguine with Pumpkin Seed, Mint Sauce and Feta Cheese; Lincolnshire Sausages with Apples and Mushrooms; and Cheese and Mushroom Souffle; and many other recipes you never before believed would cost so little to prepare. Your family will thank you for it! 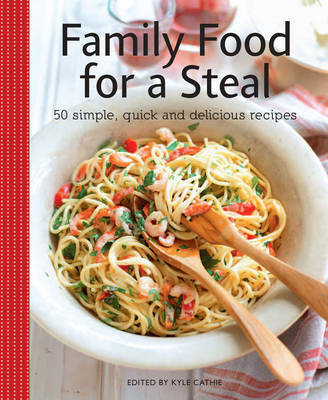 Family Food for a Steal also includes meal planning and money saving tips. The book is small enough to fit in your handbag, meaning that you can plan your meals right at the supermarket.